Yorkshire is a beautiful place to visit. I should know because I’m from there! One of the best places to visit for a resort experience has to be Harrogate only a stone’s throw from Leeds. I’ve been there twice for a spa experience at university and I also shook a bucket for charity around there and I could help but marvel at the Victorian architecture that dominates this town. Here’s a quick travel guide to this fantastic spa town. Famous tearooms and lovely gardens are two of Harrogate’s best attractions for tourists. Known for its beautiful gardens and spa waters, Harrogate is one of England’s most popular resort destinations. From shopping to scenery, this beautiful Victorian spa town has a huge amount to offer for travellers seeking rest and relaxation. From the best ways to travel to Harrogate to the city’s best attractions, read on to learn more about one of Britain’s finest spa destinations. Harrogate is well-connected to other British cities by road, rail and air. One of the best ways to access the town is by train. The convenient Harrogate Train Station offers direct links to London Kings Cross, Leeds, York and several other cities. The easiest way to reach Harrogate by air is by travelling to Leeds International Airport. From here, the convenient 737 bus links Harrogate with the airport on a frequent basis. Finally, Harrogate is an easy town to reach by road. Travellers driving from London can easily reach Harrogate from the A1. For a more scenic experience, take the exit to Wetherby to enjoy a lovely – and very efficient – detour through the countryside. Enjoying Harrogate: What Should You Do? Harrogate is one of England’s most beautiful towns, offering visitors a large range of stunning gardens and historical buildings to explore. Start at the Valley Gardens – an incredible 220-acre botanical garden complex located in the heart of the town. Other great local gardens include the Brimham Rocks – a weird but interesting rock formation located outside the town – and the Royal Horticultural Society’s Harlow Carr garden, which is home to a stunning selection of local plant life. Harrogate’s history as a spa destination has left it with several stunning historical buildings for travellers to visit. The Ripon Cathedral is an incredible English Gothic structure located in the city centre, while the Ripley Castle and Gardens are located just outside the town on a truly beautiful section of English countryside. Sleeping in Harrogate: Where Should You Stay? Most of Harrogate’s hotels are located to the north of the city centre, with several good hotels within walking distance of Franklin and Ripon Rd. For the authentic Harrogate experience, try staying in one of the city’s many historical buildings, a large variety of which have been restored into comfortable, modern hotels. Click here to view our recommended Hotels in Harrogate from Coast & Country Hotels. Dining Out in Harrogate: Where Should You Eat? Harrogate is home to one of England’s most well-known tearooms. 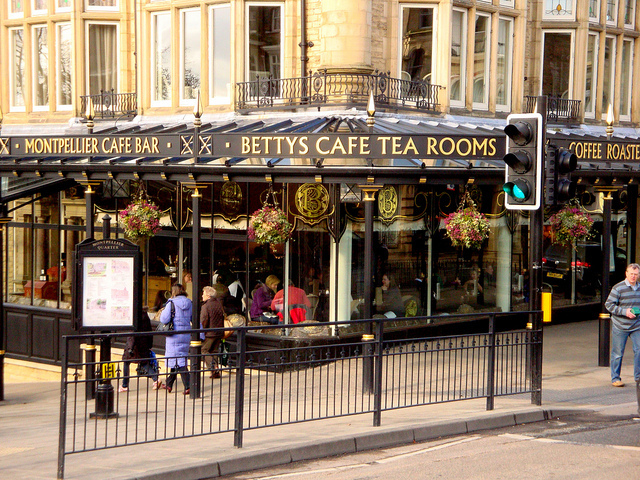 Frequented by the Queen, Betty’s Café Tea Rooms is one of the town’s top culinary hotspots, with lengthy queues appearing during the peak weekend dining hours. If Royal tearooms aren’t your style, the town is also home to a wide range of great local restaurants and bars that may be of interest. Van Zeller and Le Jardin are two popular local choices, both of which are located on charming Montpellier Parade. Harrogate is a wonderful destination for theatre enthusiasts, with two of the most popular theatres in the region found within its city streets. The Royal Hill Theatre, an impressive Edwardian Theatre finished in 1903, is a great place to enjoy a night out with high quality, impressive entertainment. The Harrogate Theatre, located on Oxford Street, is another great place to enjoy a fun, artistic night out. Local productions and comedy shows make Harrogate one of the best towns in the region for enjoying an entertaining, amusing night out.